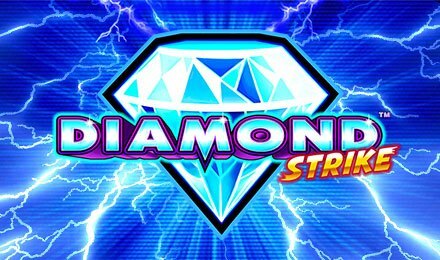 Enjoy a sparkling experience on Diamond Strike Slot by Pragmatic Play! It is playable at Moon Games and consists of 5 reels and 15 paylines. Get the chance to see brightly coloured symbols while you spin the reels. It is all set against a dark blue backdrop, with flashes of lightning above the reels. This colourful game cannot go unnoticed! On the reels, the different symbols you can find are the Red 7, Bell, Cherry, Watermelon, Plum and Lemon. Launch this magnificent slot on any type of device at Moon Games! Enjoy the sparkling Diamond Strike Slot by placing your bet using the – and + buttons. Choose your preferred bet level and hit the Spin button. Earn a win with a combination of 3 or more similar symbols on the reels. Alternatively, go for 10, 20, 30, 50, 70 or 100 automatic rounds with the Auto Play option. Bet Levels: Up to 10 betting levels are available. Amount of Paylines Selection: The 15 paylines are active throughout your gameplay. Coin Values: The different coin denominators are £0.01, £0.03, £0.05, £0.10, £0.20 and £0.50. During the Bonus Game, pick a White Diamond to reveal a Jackpot symbol. When you match 3 of the same symbols, you can trigger the corresponding jackpot. The “Free Spins” icon acts as Scatter on Diamond Strike Slot and helps to trigger the Free Spins round. Land 3 such symbols on reels 1, 3 and 5 to enjoy 8 free spins. Special reels come into play during this feature. At the beginning, extra White Diamonds are added to all the reels. The good news is that you can trigger an unlimited number of free spins! Land 3 more Scatters on reels 1, 3 and 5 to be awarded 8 extra spins that are added to the remaining ones. The White Diamond symbol stands for Wild on Diamond Strike Slot. It replaces any other symbols, except Free Spins and Golden 7. Bring sparkles to your eyes while you enjoy Diamond Strike Slot at Moon Games. At the same time, discover a wide selection of similar games on the site. Best of luck!